Noah Berlatsky : The all-female 'Ocean's 8' is easily the best film of the franchise. They should've ditched the men sooner. Noah Berlatsky The all-female 'Ocean's 8' is easily the best film of the franchise. They should've ditched the men sooner. Replacing the men with women allows the film to capitalize on the strengths of its predecessors while also jettisoning many of their weaknesses. The “Ocean's” series of heist films has always been a celebratory ham-fest, in which an ensemble of Hollywood stars demonstrates transcendent cleverness by playing a bunch of transcendently clever criminals. Those criminals are (virtually) all guys, and sparkling bromances have been central to the film's humor and aesthetic. There was some reason to wonder, therefore, how the all-female “Ocean's 8” reboot could capture the films’ particular suave swagger. As it turns out, there was no need to worry. “Ocean's 8” is easily the best film in the franchise so far. Replacing the men with women allows the film to capitalize on the strengths of its predecessors while also jettisoning many of their weaknesses. “Ocean's Eleven” (2001), “Oceans' Twelve” (2004) and “Ocean's Thirteen” (2007) were all just practice runs for the real heist, a multi-film preparation for the women of “Ocean's 8” to steal the franchise's mantle, once and for all. “Ocean's Eleven” (2001), “Oceans' Twelve” (2004) and “Ocean's Thirteen” (2007) were all just practice runs for the real heist, a multi-film preparation for the women of “Ocean's 8” to steal the franchise's mantle. “Ocean's 8” starts in much the same place as “Ocean's Eleven;” the title character (in this case Sandra Bullock's Deborah Ocean, Danny's sister) is released from prison and immediately starts planning a daring heist. In this case, the plot is to steal a fabulous Cartier necklace from the neck of Daphne Kluger (Anne Hathaway) at the glamorous Met Gala. But unlike its predecessors, “Ocean’s 8" finally gets the franchise's ensemble balance right. The earlier trilogy focused largely on George Clooney as Danny Ocean and Brad Pitt as Rusty. Matt Damon got a fair bit of screen time as Linus, and actors like Bernie Mac and Don Cheadle were mostly relegated to under-utilized schtick. The logic of male-led action films also demanded romantic plots, and much of “Oceans Eleven” and the truly dreadful “Ocean's Twelve” were devoted to Clooney and then Pitt finding love — sincere emotional storylines that clashed awkwardly with the franchise’s cynicism. Having women take the lead, in contrast, has freed the series from the strict hierarchy of the marquee pecking order, as well as from the need to pretend heterosexual romance is the ultimate goal. Slimming the cast from 11 to eight helps too. While there's plenty of banter between Sandra Bullock's Debbie Ocean and Cate Blanchett's Lou, the other performers are allowed fuller backstories, and more development than secondary figures got in the earlier films. The most sustained character arc in the earlier “Ocean's” films involved Linus trying to prove himself while Danny and Rusty condescended to him — a tired, not quite parodic coming-of-age narrative. “Ocean's Eight,” in contrast, abandons the idea that heists are about testosterone and proving one’s manhood, and opts instead for good, clean ensemble fun. Helena Bonham Carter praising the perfection of Anne Hathaway's neck in a cascading flurry of mutual simpering is a flamboyant tour de force — as is a scene in which Carter and Mindy Kaling quietly panic as one strand of their complex plan threatens to unravel. For that matter, just watching Bullock, Blanchett and Rihanna exist in the same room is a joy — as the film is fully aware. In one of “Ocean 8’s” funniest meta-jokes, a character agrees to join the heist not because she wants the money, but because she's never had strong female friendships before. Who wouldn't risk prison to hang out with Rihanna and Awkwifina? Just watching Bullock, Blanchett and Rihanna exist in the same room is a joy — as the film is fully aware. Meta jokes have always been an important part of the “Ocean's series.” The franchise loves to draw parallels between actors and con artists, both of whom are in the business of pretending to be something they're not. In the first “Ocean's” film, Rusty has a job teaching poker to a bunch of teen idols like Joshua Jackson and Holly Marie Combs, all playing themselves. The only good gag in “Ocean's Twelve”was a sequence in which, Tess,(played by Julia Roberts), ran a scam in which she pretended to be a pregnant Julia Roberts, fooling even an oleaginous Bruce Willis, played by Bruce Willis. 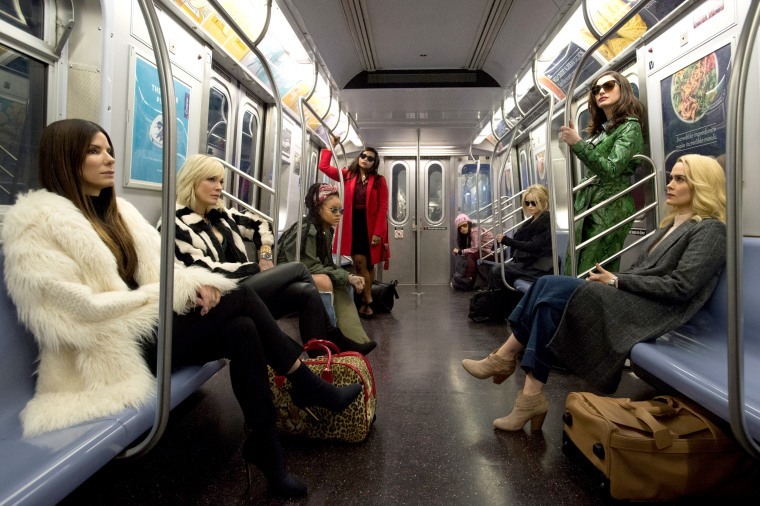 “Ocean's 8” takes these moments of winking self-reference and turns them into one long, dizzying sashay of fabulous campiness. The fact that the film is set at the Met Gala means that the actors are all constantly on the edge of tipping over into their "real" selves. The movie makes the most of having Cate Blanchett and Rihanna pretend to be stars at the event. Helena Bonham Carter's character is essentially one extended joke about the tabloid presentation of her as a spacey fashion disaster. Anne Hathaway practically steals the film with her performance as a Hollywood starlet embodying all the horrible things the world loves to hate about real-life Anne. And Anne Hathaway practically steals the film with her performance as a Hollywood starlet embodying all the horrible things the world loves to hate about real-life Anne. "If there's one thing, I know it's bad acting," she declares. It's supposed to be a self-own, because Hathaway's character is a bad actor — but it's also a knowing victory lap, because her portrayal of a bad actor is so triumphantly perfect. The film's most daring sleight-of-hand, however, is the most obvious. The pretense is that Sandra Bullock is playing Danny Ocean's sister, but really she's playing George Clooney. And while Clooney playing a suave, confident idealized vision of Clooney is impressive, Bullock playing Clooney backwards and in heels is something else again. The actors in “Ocean's 8” aren't just actors. They're actresses playing actors playing those particular kinds of actors known as cons. The movie gleefully drops in Easter eggs and cameos referencing the earlier films in the franchise, reminding you that you're watching a gender-swapped counterfeit of the original. But if there's one thing all the “Ocean's” films agree on, it's that the counterfeit always has more style than the real thing.